I had intended to keep you all informed of what is happening in the safari world but my intentions have not been matched by results. It seems that with all of today’s forms of communications I am having huge difficulties in keeping up with everything. Between answering all the inquiries associated with a safari business and keeping people informed via Facebook I never seem to have any time left. 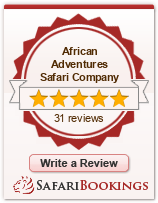 I intend to rectify this as there is a lot to talk about out there in the African Safari World. My first topic has been prompted by the success of last year’s photographic safari. In 2015 I organised and guided my first safari purely based on photographic outcomes and as an instructional tour designed for all levels of expertise. To achieve a truly spectacular outcome I enlisted the help of a great mate of mine whom I have known since I was kid in the Boy Scouts and who taught me photography way back then. John Ralph has been a professional photographer for at least forty years and he and his wife have owned and operated Australia’s largest and most successful Camera House for the past thirty years. John has become a bit of a local legend on the Central Coast of NSW as he not only sells, services and advises on photographic equipment but he specialises in conducting seminars, workshops and field trips. It was a real coup for me when he said he would come along as the ‘photographer in residence’ so to speak. This safari was a huge success and the nice part was that we had photographers in our small group who ranged from beginners to semi professional and they all gained great experience under John’s tutelage, not to mention the spectacular subject matter I was able to provide. Two of last year’s group have actually gone on to enter their photos in national and international competitions with some great results. 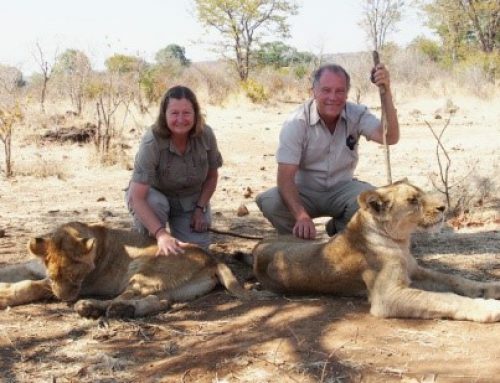 Based upon the great success of this safari tour John and I have actually gone one step further and we have put together a spectacular programme for 2016. Instead of just one tour we are now offering three photographic safaris designed in ‘modules’ which are linked so you can participate in either one, two or all three. Basically this photographic expedition starts in Cape Town in South Africa and finishes 41 days later! There is nothing to match this incredible photographic journey currently being offered by anyone in 2016. 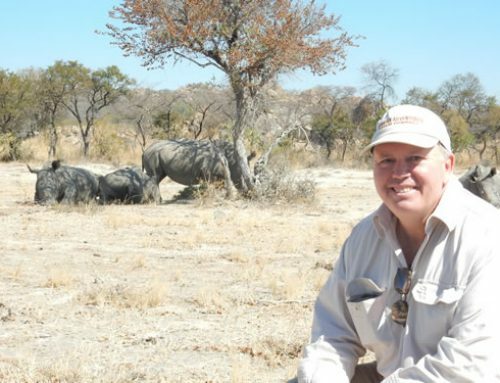 I should add at this point that John will be providing guidance, workshops and individual tuition throughout the tour which is also not a common occurrence for such safaris. By this I mean that many of these tours have a ‘celebrity’ photographer on board but nowhere in the itinerary does it indicate how much time will actually be spent with this photographer receiving guidance and tuition. Often it is more of a social connection and the photographer is a host on the tour but then they disappear to do their own photography while in the field. This does not happen on my photographic safaris as John Ralph makes himself part of everything we do and is on hand constantly for guidance and advice. This is the opportunity for anyone who is truly committed to building on their photographic expertise but do not think you must have the very best camera or a high level of experience. This is what this tour is designed to do, namely make your photography better no matter the level you are at and to capture photos of a lifetime while gaining this experience. 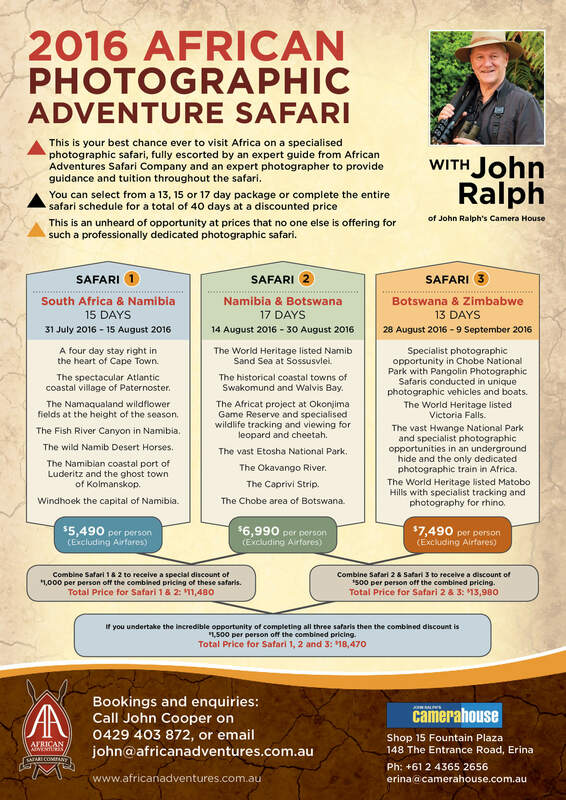 Partners of photographers are welcome along but John and I decided that this would be a photographers safari so you must be keen to capture your adventures through your lens. Contact me for full details and highly detailed itineraries for each section of these incredible tours.